The cause of the Phobos-Grunt failure lies not in the stars, or in U.S. radars, but within the Russian scientific community. Specialists from Russia’s space agency Roskosmos have not managed to determine the cause of the problem that resulted in the failure of the Phobos-Grunt Mars mission, but Nikolai Rodionov, former chief of the central spacecraft office in the Soviet defense ministry has an answer. He believes that radiation from U.S. radars could have caused the failure. Rodionov blames the failure on the American HAARP research facility, which is partially located in Alaska. HAARP, an ionospheric research program servicing the U.S. Air Force, is run by the Phillips Laboratory and subordinate signal processing and weapons laboratories of the U.S. Air Force space technology center. HAARP was originally designed to ensure continuous communications with submarines; Nicholas Christofilos, a physicist with Lawrence Livermore National Laboratory proposed using extreme low frequency waves generated by electrojets – electric currents that occur in the ionosphere – as a way to communicate with submarines. 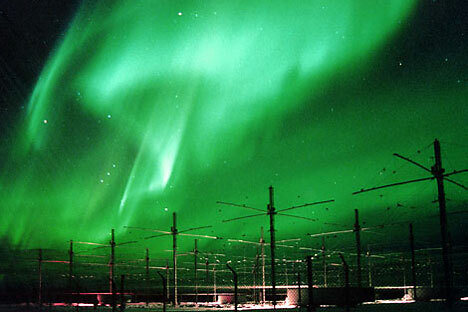 Now HAARP focuses on studying the ionosphere, which significantly affects the quality of radio communications, especially via satellite constellations. The scope of the project, in conjunction with generous financing, has caused numerous rumors and myths about HAARP, most speculating that the program is part of the U.S. weather weapon system. HAARP is, indeed, capable of fully disrupting nautical and air navigation in a selected area, blocking radio communications and radio location, disabling on-board electronics of space vehicles, missiles, aircraft and earth-based systems. Many Russian officials and military brass blame many natural calamities on HAARP. Tatiana Astrakhankina, a former Duma deputy, has been quoted as saying: “The catastrophic flood in Germany, France and the Czech Republic, tornadoes near the Italian coast, which had never witnessed tornadoes before, are nothing but the results of U.S. geophysical weapons tests.” In 2002, the Defense Committee created a table showing the adverse climate impact of the HAARP tests of ionosphere and magnetosphere modifications. There is still no plausible proof of these effects. Moreover, Russian scientists believe the energy radiated by the facility is negligible compared to the energy the ionosphere receives from solar radiation and storm discharges. The disturbance in the ionosphere cased by the HAARP radiation disappears very fast – as soon as the HAARP action stops. There are no serious scientific grounds for possible use of HAARP as an instrument to eliminate all types of weapons, power grids, pipelines, manipulate the weather, and induce mass psychotropic effects. The scientist also denies the rumors of HAARP’s implication in modern natural calamities and maintains that the objective of the program is to study the interaction between radio emissions and the ionosphere. Kuznetsov believes Americans can use HAARP to disperse GPS and mobile communication signals – but the effect stops as soon as the facility stops operating.